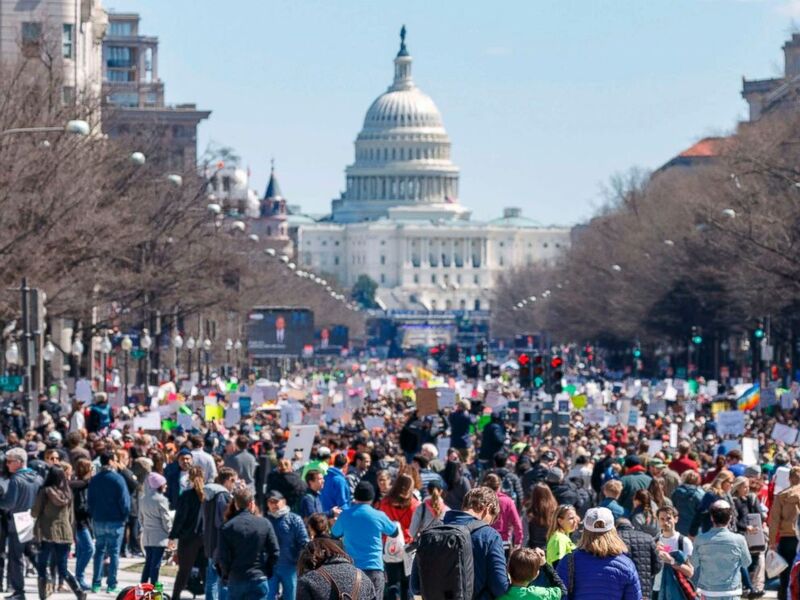 Streets in Washington D.C. to Los Angeles became seas of protest on Saturday, led by hundreds of thousands of emboldened children, students, parents, and teachers in the "March for Our Lives" event pushing to end gun violence. But on the same day of these rallies, counter-protests took place with a central message of their own: protect the Second Amendment. In D.C., the pro-gun rally was surrounded by local cops and participants waved giant American flags. The 10 to 15 protesters may have been outnumbered, but they were vocal. Calling themselves "The Patriot Picket: Defenders of Liberty and the Second Amendment" the protesters stood on Pennsylvania Avenue in the middle of hundreds of thousands of March for Our Lives participants. Gun-rights advocates rally during a protest at the Montana Capitol, March 24, 2018, in Helena, Mont. The counter-protest was held at the same time as the nationwide March for Our Lives rally was taking place. 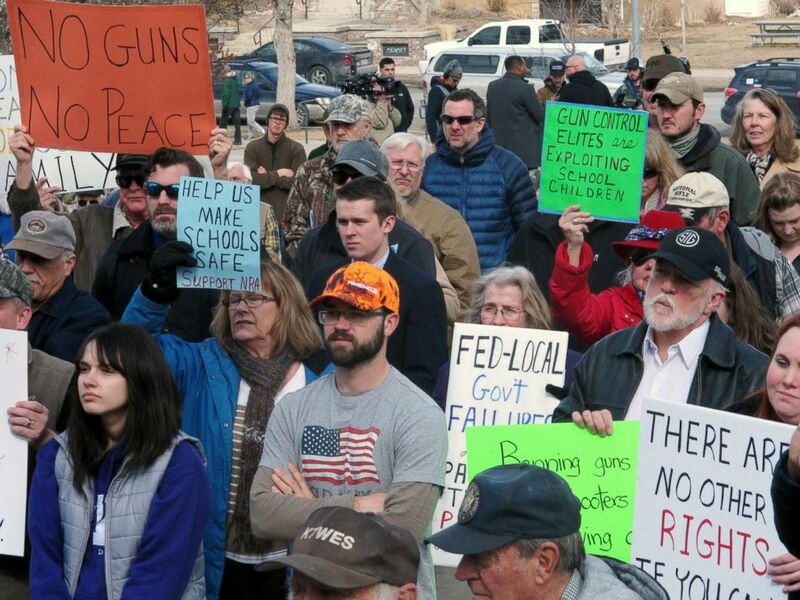 Patriot Picket founder Jeff Hulbert told ABC that they thought it was important to come to the march and exercise their right to free speech and advocate for gun rights. Hulbert said there is actually a unified message on both sides, and that is to make schools safer. In Salt Lake City, chants of "Bill of Rights" were repeated as marchers, mostly older men garbed in black or camouflage, waved American flags. And as police whizzed by on a scooter or stood at a post on a street corner, the sparse crowd of pro-gun marchers yelled "Thank you!" and "Thank you, officer for keeping us safe!" When the crowd encountered a young man with blue-dyed hair one asked him to join them: "Come with us for your freedom," the protester said. "You'll be free to keep your blue hair." In Helena, Montana, not far from a local March forOur Lives protest, as many as 300 ontanans convened for a March for our Guns rally. State Representative Seth Berglee said he was glad he was there. He said that while the event was called "March for our Guns," it just as easily could have been called "March for our Rights." "It was just get together and reiterate what we believe in," Berglee, a 32-year-old reserve policeman and former soldier. 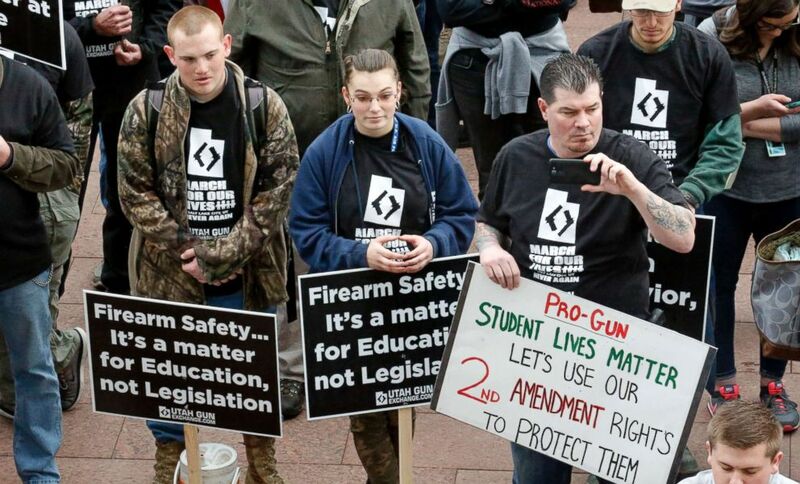 Pro-gun marchers gather during a rally designed by organizer to advocate for fortified schools and more armed teachers March 24, 2018, at the Utah State Capitol, in Salt Lake City. He said that what started as a memorial quickly turned into a march trying to tread into gun rights. "We're all against gun violence. Nobody wants to see kids die," he said. "It comes down to solutions and in my perspective, we're marching for something but we want Montanans to know we haven't had a major school shooting for years and so it's not a major issue here." Rather, Berglee would like to see armed security guards and school buildings get modernized before guns and legal gun owners are forced to relinquish certain guns or rights. In the end, he agrees with memorializing the Parkland victims, but added, "Gun rights are important."